It really does speed things up! I needed a rather specific image. A Japanese one and while I do have at least 2 La La Land stamps with Marci dressed in a Kimono, I just didn't have the physical or mental strength to colour. The Silhouette store had a lot to choose from and files that varied in terms of the number of pieces and intricacy. Once I decided I definitely wanted a Kokeshi doll I picked one that satisfied my criteria and off I went. I wanted to cut all the pieces in a single pass. It's not hard as long as you take note of where on the mat your pieces are and make sure you cut the cardstock to the right size and place in the same spot. The card was in equal parts congratulatory as it was a kind of encouragement card. 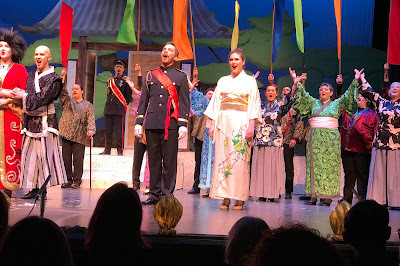 A good friend of mine was back performing again with a Gilbert and Sullivan group after a 2 year hiatus. Does it all make sense now? I went with an emerald green with subtle leaf pattern from Paige Evans' "Oh My Heart" for the kimono since my friend was also wearing a green Kimono in the second act. What for the background then? I was surprised to find the perfect floral in the 6x6 paper pad from Shimelle's "Box of Crayons". It worked REALLY well as a pattern with an oriental vibe. Shimelle again to the rescue for the sentiment. Her collections are one of the first places I would go to in order to find things pertaining to dancing and sure enough the aqua word Thickers had what I needed, except the word needed more definition against the background. One layer of blue Sharpie didn't quite do it, so I followed up with black over the top and we were in business! I rather likes the aqua edge so I didn't colour over it. If it were not for my desire to use some of those absolutely perfect word stickers, I probably would have just left the clouds on the background and maybe some kind of sparkly gems, but the words were all part of the meaning. So...I think I even surprised myself by creating a custom made card which combines, Japan, opera and paper collections which appear to be kid or superhero themed.